Google Maps may not be the hottest new thing at Google, but it’s still getting a bit of attention. Last night, at the D: Dive Into Mobile Conference in San Francisco, Google’s Android chief, Andy Rubin, unveiled some new features to Google Maps. New techniques that make it faster to draw maps on Android smartphones has made it possible for the search giant to introduce smoother, faster zooming and introduce 3D maps, reports the NY Times. No, not pop-out-of-the-screen 3D. 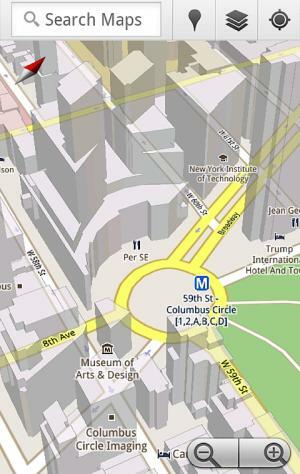 In major cities, Google Maps will allow you to rotate the camera angle, showing a 3D view of buildings. The new technique is called “dynamic rendering,” and it allows Google to draw maps in real time on Android smartphones instead of loading in pre-rendered “tiles,” like it currently does. Currently, a “screenful” of map loads on the phone, but if you zoom in, or try to move from side to side, you must wait a few extra seconds so the app can load the next “tile” of map. Dynamic rendering will allow maps to render faster, in real time, and should improve how smooth the experience is, especially when zooming in and out of a map. Since zooming is done in real time, street and building names will more quickly resize and change when you move in and out. In roughly 50 cities, Google Maps will also have 3D buildings available to view, allowing you to look at maps from different angles outside from the traditional top-down view. The benefits are huge. For example, if you’re looking for a familiar area or street intersection, now you can change the angle to see if the buildings are as tall or look as you remember. The feature is basically a step up from Street View, the most zoomed in level of Google Maps, which shows real 360 degree photos of every block in major metropolitan areas. Google obtains these photos by driving actual camera cars around the world. This new 3D maps feature does not use real photos. Finally, Maps will now have some offline capabilities. Previously, the minute you lose your wireless signal, Maps is useless. Now, Google will store frequently used maps on your phone, which will auto update every time they are viewed. This means that even if you lose signal, Google’s turn-by-turn directions may still keep working. A much needed fix for those in spotty coverage areas. The new update should arrive for the Galaxy S, Droid, Droid X, Droid 2, Droid Incredible, EVO 4G, Nexus S, and G2 in a few days. Other smartphone platforms, including the iPhone, will eventually get the new features as well. UPDATE 11:38 a.m. EST: Video of the Google Maps demonstration can be found here.